GuitarFreaks V8 + Drum Mania V8 are the 20th versions in the long running music video game series from Konami. This version supports e-AMUSEMENT PASS where available. With the use of the e-amusement pass, when players play they can earn and accumulate "GDP". Once enough points have been collected, players are able to play a hidden song. With the e-amusement pass players can also save their data, including detailed information about song results and percentage complete. 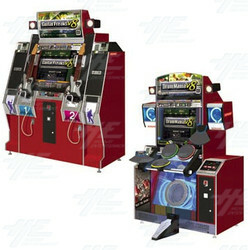 GuitarFreaks V8 + Drum Mania V8 are the 20th versions in the long running music video game series from Konami. This version supports e-AMUSEMENT PASS where available. With the use of the e-amusement pass, when players play they can earn and accumulate "GDP". Once enough points have been collected, players are able to play a hidden song. With the e-amusement pass players can also save their data, including detailed information about song results and percentage complete. This videos is of Guitar Freaks V8, the music and rhythm arcade game. This game simulates guitar playing action through the guitar style control, which has several coloured buttons and a strum mechanism. Players must hit the button with the corresponding button on screen at the same time they 'strum'. The more accurate the players is, the more points they will earn and win the game - passed on a pass/fail type system. This video shows the beginners' gameplay from the 20th version in the Guitar Freaks series, suitable for players new to the game. This videos is of Guitar Freaks V8, the music and rhythm arcade game. This game simulates guitar playing action through the guitar style control, which has several coloured buttons and a strum mechanism. Players must hit the button with the corresponding button on screen at the same time they 'strum'. The more accurate the players is, the more points they will earn and win the game - passed on a pass/fail type system. This video demonstrates how to play the attract mode on the 20th version in the series.